One of the most unique things I've found about Augusta (and one of my favorite things), its river has tides. 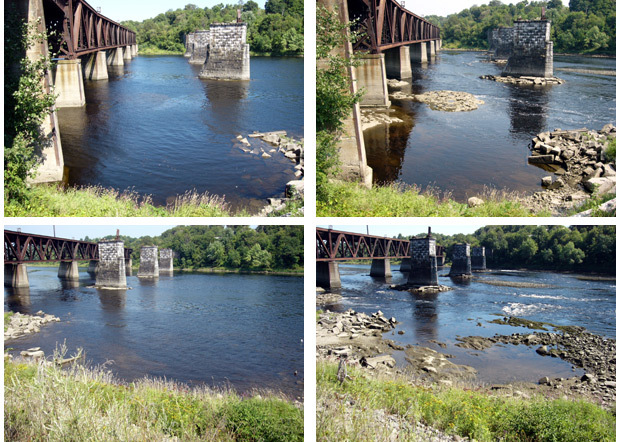 The Kennebec River is one of the strongest pieces in the identity of all of the towns along it, from Waterville, and then Augusta at the northern-most navigable width of the river, to the salt flats around Merrymeeting Bay. I still don't have a car, so I only know this through word of mouth and through reading the paper. Everyone who's from here remembers a time when mills crowded both sides of the river. Now they are big rusty carcasses lying between pine trees and the Kennebec. Like dinosaurs or elephants that starved to death and eventually died by the drinking hole. But there are some good things sprouting out of the death of the industries here, like more of an emphasis on state education. This is the first year it became mandatory for all graduating students to take the SATs. The loss of factories took away a lot of jobs, but the river is becoming cleaner. It seems like local agriculture and smaller farms are seeing a bright spot (at least better than Pennsylvania), because there are so many farmers' markets. Of course, a lot of people going to these farmers' markets are single people driving giant 4x4 pickup truck/nearly tractor-trailers. There are a lot of strange things to see in Maine, so far I think I've seen very little. I was sitting by the Kennebec today writing postcards. You could see the river flowing north on the edges, and being pulled south in the center, strange. I think the fountain in downtown Augusta has got to have the cleanest tasting water of any city fountain I've ever drank from. Not the usual dirt flavor. But some of the people walking around here might make you think something is in the water. It's interesting.